Working on Breathing Techniques When Running! A little bit ago I wrote about how I’m struggle with breathing evenly when doing speedwork. Sometimes I end up gasping for air and feel lightheaded after a hard mile. Since Lauren can run a 10K in 36 minutes and 10 miles in 60 minutes, she kind of knows everything about running fast! 1. Try out this technique: Lay down on the floor and place your hand on your belly and breath deeply. If your feel your hand rise and fall then you are belly breathing, which is good. If your chest moves up and down you’re not breathing deep enough. Practice belly breathing and incorporate into your runs. 2. Also try this: After running a mile at a moderate pace, place one hand on your chest and one hand on your belly. Your top hand should be relatively still, but the hand on your belly should move in sync with your breathing. 3. Keep your mouth open. It’s bigger than your nostrils and more effective at taking in oxygen. It also keeps your face more relaxed. 4. Coordinate your inhales and exhales with your footfalls. Start with a 2-2 pattern breathe and advance to 3-3 and 4-4 patterns. 5. Use Pilates to strengthen your diaphram. The below exercise is recommend along with the two others here (scroll down a bit). I’m definitely a chest breather right now, but am working hard on breathing from my belly. I’m also consciously working on doing a 2-2 pattern when running at a moderate or fast pace. When I am running at an easy pace I generally do 2-2 or 3-3 naturally. What’s been interesting is that if I try to run fast outdoors I have a much easier time following the 2-2 pattern than when I’m doing speedwork on the treadmill. I think it’s because I’m always scared that I’m about to go flying off the treadmill and hold my breath, haha. Do you follow a certain breathing pattern when running? Have you tried the hand of your chest/belly technique to see if you’re a chest or belly breather? Previous Post That Just Happened! have you ever seen this? I have tried to work on it, but boy breathing is tricky considering it’s something we are supposed to do without thinking lol When I get to gasping I try to start double pulling in my nose then pushing out hard and that seems to help me get a rhythm going again, but trying to really belly breath is till not coming naturally at all to me. Thank you! I had not seen that video! It is so hard to belly breathe. Every time I find myself gasping for air, I have to consciously remind myself to breathe deeply for a few minutes to get into a good groove. We just have to keep at it and maybe it will come naturally at some point! Sounds like your new coach is awesome in many ways – love all the info she sent you on breathing. I learned years ago (high school so a lot of years back!) the breathing pattern that works best for me. I can always tell when I’m being lazy and not focusing on my breathing – it makes a huge difference. My younger son gets side stitches, I will have him do the test with his hands on his chest and stomach. I am hopeful that it will make a huge difference for me too. I feel like I’m right on the cusp of making a huge breakthrough… my legs want to go faster! I hope that your son can get rid of his side stitches with some breathing techniques! Thanks to the foam finger, GO HEAT GO! 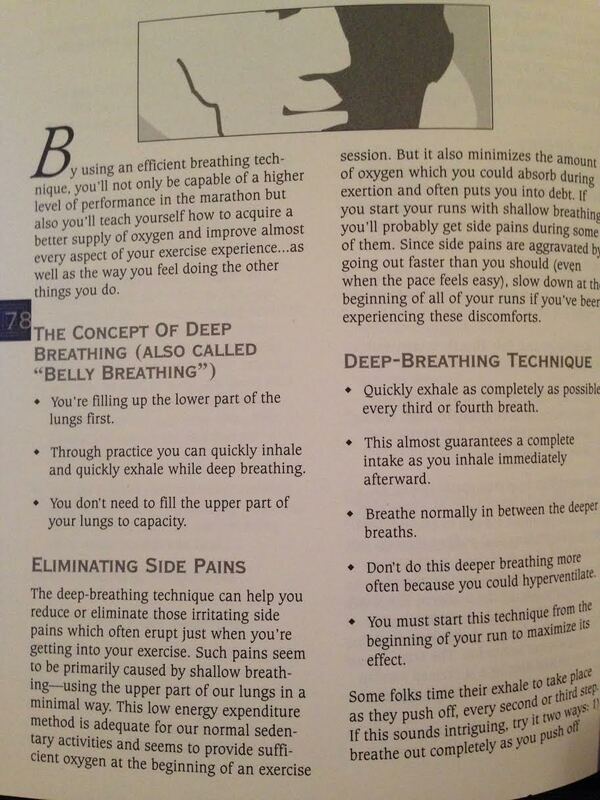 I had always just let the breathing happen, but I guess I’m not too good at it, haha! I read in Scott Jurek’s book about trying to get a certain number of steps per minute. For a while I tried to count my steps to reach that, but now I just go with the flow. It feels so much more natural! I’m glad that you are able to use the tips too!